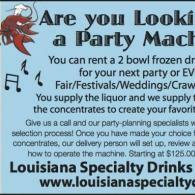 New Orleans Choice In Margarita Machine Rentals! 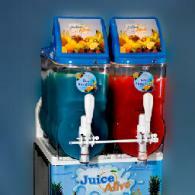 Rent Your Frozen Margarita Machine Today! 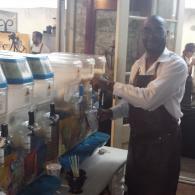 Premium Margarita Machine Rentals, Get Yours Reserved Today! 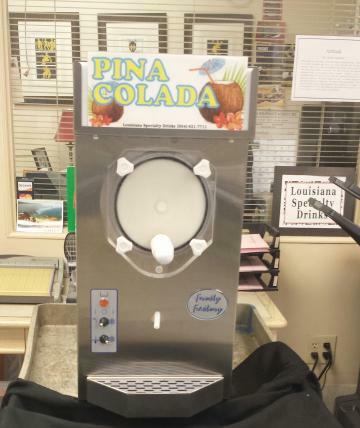 For over 30 years, Louisiana Specialty Drinks has added a unique touch of the deep South to a wide array of events, parties, and weddings with frozen drinks such as daiquiris," alcohol and non alcohol" We provide frozen drink machine rentals, helium tanks, balloons and even bottled water with personalized, custom labels! Personalized water bottles can be customized with your name and affordable party favors! 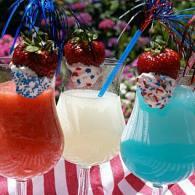 Whenever or wherever you decide to throw a party, we'll be there to provide the fun! Whether you're looking for a helium tank to rent, balloons for your next party or corporate event, or a combination of the two, Louisiana Specialty Drinks has what you need! You want an effective way to get your business information into the hands of as many people as possible. Everyone needs water--and new brands of artesian spring water are constantly added to coolers everywhere. Why not put your business name on the water bottle label? Putting your private label alongside today's premium bottled water brands is easy and cost effective.